“There are two ways to face the rainless weeks. One is to water, and the other is merely not to.” Elizabeth Lawrence, a Southern gardener. Perhaps this is a bit too simplified, but we do have to face the fact that in a world of overburdened water supplies and weather extremes, conserving water in the landscape whenever and however we can has never been more critical. During July, August, and September, Texans’ increase their water use by as much as 58%, with half of what is used to irrigate landscapes being wasted due to over-watering or runoff. The projection for the Houston area is that the population will double by the year 2030, but our water supplies are finite leading us to realize that even though we may get all the rain we need, more people means water shortages–frog-strangling deluges or not. With an extended drought looming over Texas, we have the opportunity to rethink how water is used or misused in the landscape. Conserving just 25% of outdoor water use, municipalities could see a decrease of many millions of gallons of water per day—17 million gallons for Houston alone, according to the Texas Commission on Environmental Quality and the Texas Water Development Board. Twenty-five percent is an achievable goal, if we prepare now and become “WaterSmart” about this precious natural resource. With some forethought, it is possible to have a beautiful landscape despite what Mother Nature sends our way. Think compost: Compost (organic matter) added to soil increases the soil’s water holding capability while adding important nutrients plants need. More compost equals less runoff. Backyard composting not only saves yard and kitchen waste from ending up in the landfill, but is virtually free. Good quality compost can also be purchased if the gardener becomes educated in identifying the high quality material from what may be merely finely ground mulch. Both sandy and clayey soil can be greatly improved by the addition of compost. The particles of compost act as sponges between large sand particles, greatly increasing moisture retention. Clayey soils benefit from the addition of coarse organic matter which helps to aerate the soil and increase drainage. 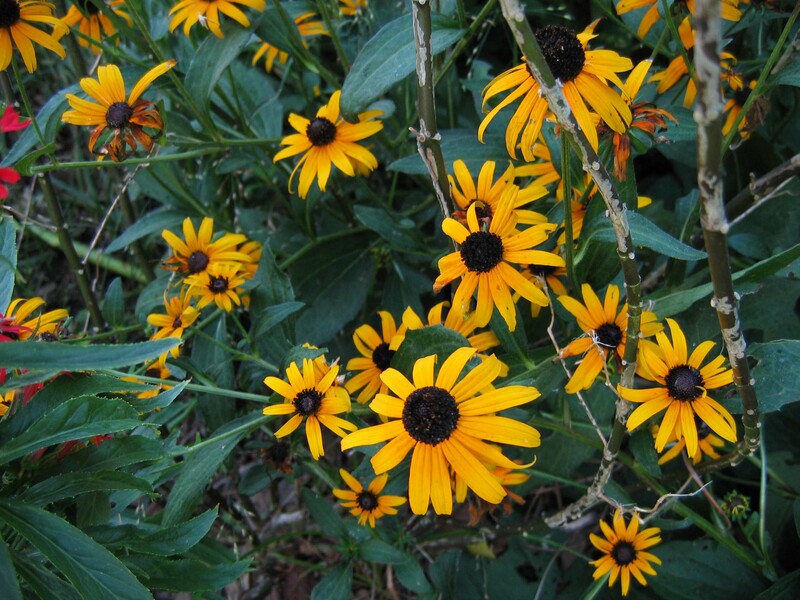 Think plant selection: Plants that can tolerate Houston’s periods of droughts and floods can be found in native and non-invasive adapted plant categories. While it’s tempting during the threat of drought to run out and purchase drought tolerant plants, unless they are placed in raised beds, they will not survive when our normal winter rains come. Plants that enjoy dry conditions in their native habitat will not tolerate over-watering. Keep in mind these species need at least two growing seasons to become established before the water can be drastically cut back. Notice “cut back”, not stopped. Even water thrifty plants may need supplemental watering during extended periods of drought. Think zones: When designing the landscape, install plants that need the same water requirements together. Plants that like it wet should be planted closer to the house and water supply; moderate moister users need water during prolonged dry spells; dry-loving plants can be enjoyed often with natural rainfall, as long as they are well established. Also, larger, more established shrubs and perennials will not require the same amount of water as annuals might. Rethink the lawn: Lawns planted with typical turf grasses are normally water guzzlers. In fact, turf grass is America’s largest irrigated crop. Reducing the size of the lawn can reduce water need and offers a space to incorporate more interesting plantings—perhaps a butterfly or humming garden. Drought tolerant ground covers are another option. Native clumping grasses can add structural and textural interest to the landscape and with their extensive root systems can withstand periods of drought. In general, we over-manage our lawns with too much water, fertilizers and pesticides. St. Augustine is quite tolerant of drying out. By raising the mowing height to 3 ½ to 4 inches the extra height will provide of bit of shade and reduce evaporation. Fertilize in the spring and fall with ¼ to ½ inch of screened compost to maintain the soils ability to retain moisture. Think mulch: Adding two inches of mulch to planting beds helps conserve moisture while adding organic matter as the mulch decomposes. 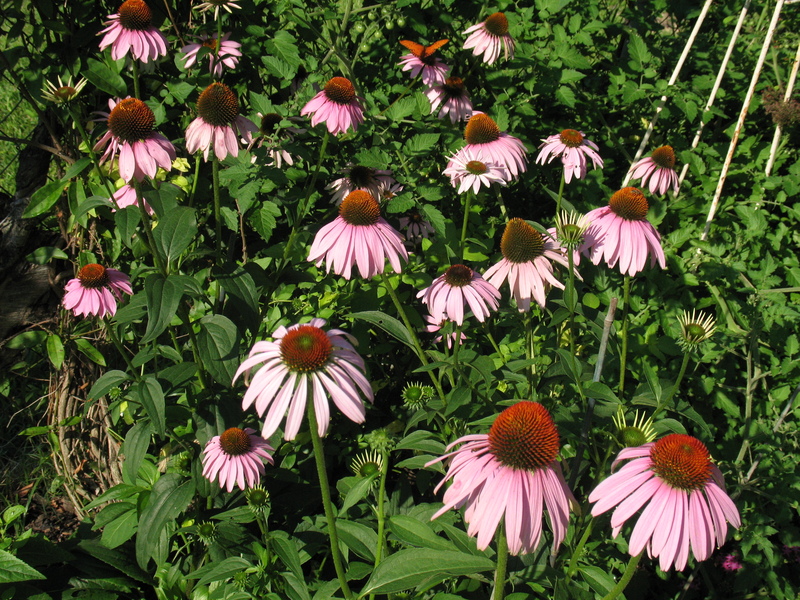 Just be sure to pull back mulch from the crown area of perennials and shrubs. When mulching around trees, avoid piling it up against the bark. The flare (curved area at the base of the tree) should always be visible. Mulch also helps keep weeds down, reduces soil compaction and keeps temperatures even around fragile root systems.